Summary: A new survey by the FDIC shows community banks support businesses with both flexibility and rigor. How does your bank compare? 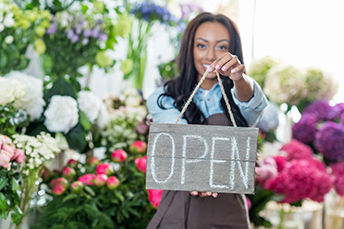 The SBA reports it can cost as little as $3,000 or less to start a micro-business, while research by the Ewing Marion Kauffman Foundation some years ago found the average cost to start a small business was just over $30,000. Of course, this depends on the type of business and how it is structured, but it is interesting nonetheless. Also of note, the SBA reports about 80% of small businesses survive their first year of operation and about 50% make it to 5Ys or longer. We bring this up of course, because so many community banks excel when it comes to banking small businesses and building close customer relationships. Most community banks still overwhelmingly use in person applications vs. online for business loans. In addition, loans are often tailored vs. using standardization. After all, competition is fierce and that is often what it takes to win the business. Those two characteristics are among several that distinguish the small business lending practices of community banks from larger ones in a new survey by the FDIC. It looked at small business lending practices of almost 1,200 banks. The survey found banks with < $10B in assets accepted small business loans primarily in person vs. online. This group also said they took applications at headquarters, branches or in visits to the businesses. Only 11% said they accepted applications through their website and only 1% accepted applications through a third party's online system. This indicates partnerships with new digital Fintech lending platforms are still at every early stage. In a call with bankers to present some of the survey findings, FDIC officials noted that one of the trends that came across in the survey is that community banks tend to use a more labor-intensive process in dealing with small business customers. This is true not only when accepting applications, but also in how loans were processed and how loan customers were treated. These personal touches remain a hallmark of community banks and may represent a still strong countermeasure to the impersonal digital platforms on the rise today. According to the survey, community banks are much less likely to use standardized small business loan products than big banks (9% vs 65%). These banks are much less restrictive in defining small businesses by size, with 28% of small banks using thresholds to define small businesses, compared to 85% for large banks. Surveyed community banks are also much less likely to require minimum loan amounts (15% vs. 70% for large banks). In short, when it comes to small business loans, community banks are far more likely to be flexible in who they lend to, how they structure loans, and how much they lend. But that's not to say that community banks are lax in their process. On the contrary, when it comes to underwriting, community banks seem decidedly conservative. Of the surveyed banks with less than $1B in assets, the survey found 90% to 95% said their underwriting criteria always or almost always consider debt service coverage, loan-to-value and business owner net worth. Other traditional underwriting criteria like owner's experience, credit score and business cash were always or almost always considered by 80% to 85%. The December teleconference presented some early findings from the survey, which took place over an extended period from 2016 to early 2017. The full survey results will be released this year (we will let you know when) and should include more information about competitive issues in small business lending. The bottom line of all this is that community banks are sticking with tradition when it comes to underwriting, but being flexible in loan structure. Community bankers also use a personal touch to appeal to small business owners. Those hallmarks stand in contrast to the rise of online platforms, which may be quicker, but can also frustrate some owners seeking individualized loans from lenders who understand their needs and are willing to be flexible when structuring loans. Bank Director finds the technologies that directors believe will impact their bank the most over the next 5Ys are: mobile (79%), cloud (67%), big data/data analytics (65%), automation (61%), application programming interface (49%), artificial intelligence (39%), biometrics (36%), & blockchain (32%). 1) The Park National Bank ($7.8B, OH) will acquire the 91.45% of NewDominion Bank ($322mm, NC) that it does not already own for about $76.4mm in cash (40%) and stock (60%) or about 2.01x tangible book. A GOBankingRates survey finds 57% of Americans have less than $1,000 in a savings account. Even more alarming is the fact that included in that percentage is the 39% of people with absolutely nothing saved. The IMF increased its global growth projections for 2018, driven by the US tax cut effects. It expects US growth to reach 2.7% in 2018 vs 2.3% prior. Bankers welcome tax relief, but some nuances need careful review to make the most of the new tax plan benefits. To learn more, download our white paper, "New Tax Overhaul: What It Will Mean for Your Community Bank and Your Customers" today.